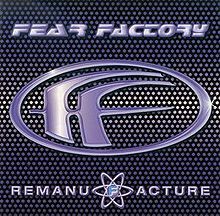 FEAR FACTORY - REMANUFACTURE (CD) | Online Shop | Wizard LTD.
Remanufacture – Cloning Technology (sometimes referred to Remanufacture) is a remix album of the second album Demanufacture by Fear Factory, released on May 20, 1997. It is sometimes considered to be the band's third album, and the sequel to Demanufacture. The titles of the original songs are in brackets. All songs composed by Burton C. Bell, Dino Cazares and Raymond Herrera.